Lebanon National Cemetery in Lebanon, Kentucky. In the Civil War, disease killed more soldiers than bullets. The men of the 36th Indiana learned this startling fact quickly. There’s little question that the gathering of lots of men from small communities and farms across the countryside into tightly packed camps with questionable hygiene had a deleterious effect on the general health of the army. In the end, two men would die of disease for every one that died of battle wounds. Five thousand died of measles alone. Epidemic diseases like measles, mumps and smallpox rampaged through the camps full of new volunteers in late 1861 and early 1862. When the 36th Indiana joined General Nelson’s gathered forces at New Haven, Kentucky and nearby Camp Wickliffe in the fall of 1861, disease became a part of life. The fighting, that winter in Camp Wickliffe, was continuous, but it was fighting a more potent foe than the Southern army. Disease of various kinds played havoc with the men, and no precautions served to avoid it. Measles was perhaps the most calamitous visitation; many men who recovered from the direct attack were left to fall into some other ailment more or less serious. Battles of great note have been fought with less loss than was sustained by the troops at Camp Wickliffe. 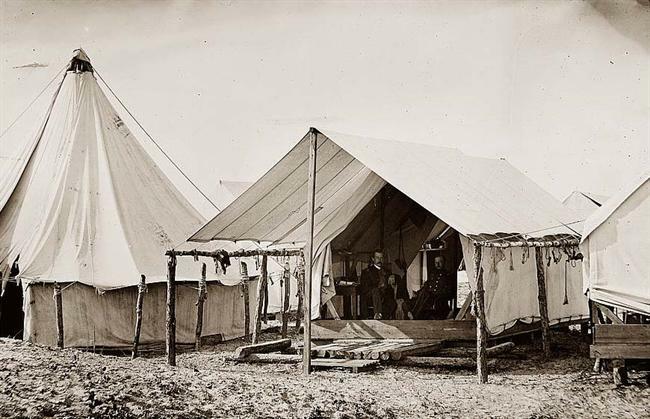 Sibley tent on the left, wall tent on the right. For many of the men, any measures to slow down disease were too little, too late. In L.K. Harris’s Company F of the 36th Indiana alone, three men died of disease in the winter of 1861-62: William Funderburg died on December 18th at New Haven; Nathan Danner died at Camp Wickliffe on January 7th; and Christopher Jordan also died on January 7th and was buried in Lebanon, Kentucky in what is now called Lebanon National Cemetery. In addition to these three whose deaths are recorded, six others from Company F are listed as discharged due to disability. They almost certainly were suffering from one ailment or another. Every company, every regiment felt the sting of death. One victim was another ancestor of mine: Samuel A. Thorn of Company B of the 36th, my great-great grandmother’s cousin. Samuel enlisted in September 1861 when he was 17 years old. He took sick almost immediately and ended up dying of pneumonia at Camp Wickliffe on January 5, 1862. These boys who had gone off to war seeking after glory found rain, mud and dysentery instead. They ended up fighting an enemy more terrifying than any Southerner: the unseen and unknown germs that filled their camps. Many died; many others deserted out of fear and frustration or were discharged for disability. The rest went on to fight a more human enemy on a more typical battlefield, but the specter of disease and the memory of suffering comrades surely never left them. An award-winning book by Drew Gilpin Faust on death in the Civil War is called This Republic of Suffering: Death and the American Civil War. This entry was posted in 36th Indiana Infantry and tagged 41st Ohio Infantry, Camp Wickliffe, Christopher Jordan, death, General William Nelson, measles, Nathan Danner, New Haven Kentucky, Samuel A. Thorn, William Funderburg. Bookmark the permalink.